A bright, white smile can do wonders for your appearance. It projects health and vitality, helping you make the best impression in both personal and professional interactions. Unfortunately, it's easy for your teeth to become discolored even when you are extremely diligent with your oral hygiene regimen. If you lack confidence in your smile due to stained or yellowed teeth, you may want to consider a teeth whitening treatment. Teeth whitening is one of the easiest and most affordable ways to revitalize your smile. In just one brief office visit, our Lakewood teeth whitening specialist Dr. Scott Greenhalgh can help you restore a bright, dazzling smile that you will flash with pride. During his more than two decades of experience with teeth whitening, Dr. Greenhalgh has learned what works and what doesn’t. He offers a number of options so that you can get the right treatment to help you achieve your goals. The best way to learn about our Denver teeth whitening options and receive individualized cosmetic dentistry treatment recommendations is to speak with Dr. Greenhalgh in person. Please call 303-988-9060 today to schedule a consultation. We serve patients in Lakewood, Denver and the surrounding areas of Colorado. Although there are steps you can take to prevent teeth stains, the natural effects of aging and certain lifestyle choices will eventually lead to some degree of tooth discoloration. For example, smoking can result in significant discoloration to your teeth. In addition, certain chemicals used in medications can cause your teeth to become stained. These stains are different than those caused by the foods you eat, and they may not respond as well to teeth whitening treatments. Am I a Candidate for Denver Teeth Whitening? Fortunately, most people who would like to brighten their smile are excellent candidates for teeth whitening at our Lakewood cosmetic dentistry office. You should have healthy teeth and gums with minimal fillings or other dental restorations. In addition, teeth with yellow-toned stains tend to respond best to whitening treatments. In these situations, Dr. Greenhalgh may recommend another solution such as porcelain veneers to brighten your smile. During your initial teeth whitening consultation, Dr. Greenhalgh will evaluate whether teeth whitening will be an effective solution for you and recommend the best treatment option for your unique individual needs. If you're considering brightening your smile, you have a wide range of options available to you. Many of these options are over-the-counter teeth whitening products which are significantly less expensive than professional-grade teeth whitening treatments performed by a highly skilled and experienced cosmetic dentist. However, it's important to understand that when it comes to tooth whitening, you usually get what you pay for. Stronger bleaching gel – The bleaching gels used in professional-grade whitening systems are significantly stronger than those used in over-the-counter whitening products. This allows you to achieve a much brighter smile when you whiten your teeth with a cosmetic dentist. Minimizes tooth sensitivity – The professional-grade whitening systems used by Dr. Greenhalgh are administered with customized whitening trays that are designed to fit the unique contours of your mouth. This ensures the bleaching gel only makes contact with your teeth, not the surrounding nerves and gum tissue. Ultimately, this is the most effective way to minimize sensitivity to the bleaching gel. In contrast, over-the-counter products use generic one-size-fits-all bleaching trays, which make it significantly more challenging to achieve a proper fit. This results in a greater incidence of tooth sensitivity. Quicker results – You can brighten your smile up to 8-10 shades during one teeth whitening session in our dental office. When you use over-the-counter products, it will take much longer to achieve your desired results, and often you won't be able to achieve the same level of brightness. Professional supervision – Dr. Greenhalgh will personally administer your teeth whitening treatment, ensuring that everything is done safely and properly. Please check out our Cosmetic Dentistry Blog if you want to learn more about Teeth Whitening! Teeth whitening dentist Dr. Greenhalgh offers both in-office and at-home teeth whitening options. Both of these methods deliver the same great results. The best teth whitening option for you will depend on your preferences. Would you rather brighten your smile in one office visit or would you prefer to gradually whiten your teeth in the comfort of your own home? Zoom! 2™ tooth whitening uses a light-activated hydrogen peroxide gel to achieve an extraordinary whitening transformation. The procedure is quite simple. First, we will take steps to protect your gums, tongue and cheeks, as it's important to protect the soft tissue of your mouth. Second, we will apply the hydrogen peroxide gel to your tooth enamel. Finally, we use a special lamp to heat the gel, which is then oxidized and absorbed into your enamel. The gel can then whiten from the inside of the enamel, meaning the results aren't just surface level. 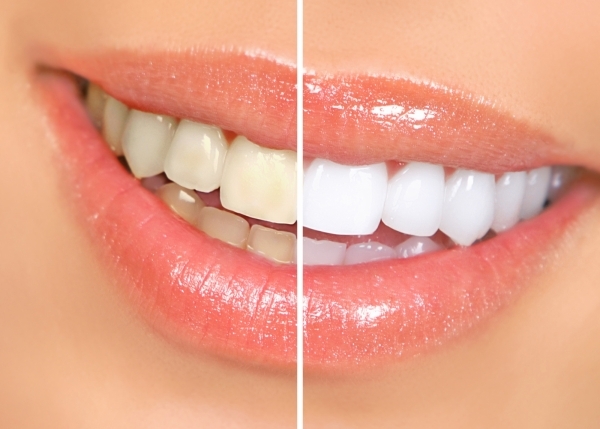 Zoom!2 can brighten your smile up to 8-10 shades in just one Lakewood teeth whitening treatment. The teeth whitening procedure itself takes about an hour. It's safe and produces no discomfort, though increased sensitivity is fairly common for a short duration of time after whitening. Not every cosmetic dentist offers Deep Bleaching™, but we do. We recommend it highly if your teeth are noticeably yellowed or more deeply stained than average. This will give you the best teeth whitening result and the least sensitivity of all teeth-whitening options. You will also have your customized trays to use at home for touch-ups at any time. Dr. Greenhalgh offers take-home kits that include custom trays made just for you. This will avoid the potential problems of sore teeth and gums and significant sensitivity that you can get by using store-bought kits. If you would prefer to whiten your own teeth at your convenience, NiteWhite take-home kits are an excellent option and can give you very pleasing teeth whitening results. Your decision on how to accomplish your teeth whitening may be influenced by several factors. Depending on your preferences, you might want the extra brightness of Deep Bleaching™ or the more subtle results of an at-home kit. If you have a very busy lifestyle, the Zoom2™ route may be best for you. Your budget may come into play as well. Please see our page on Financing Options for how we can help. To learn more, please read our Teeth Whitening Questions page. Don't smoke -- As mentioned above, smoking will tarnish your smile, giving you yellowed and dingy looking teeth. If you do smoke, quit. Improving your smile is just one of the many benefits you'll experience when you stop smoking. Minimize your consumption of staining agents -- While it's unreasonable to expect that you will completely eliminate staining foods and beverages from your diet, limiting their consumption will help you preserve a bright, white smile a little longer. Drink with a straw -- Whenever possible, drink beverages that may stain your teeth through a straw. This will minimize the contact between these liquids and your teeth, which will help keep them brighter and whiter. Practice Great Oral Hygiene -- You probably can’t avoid every food that could possibly stain your teeth, but you can make sure to brush or at least rinse right after consuming them. In addition, make sure you brush at least twice a day and floss at least once a day to keep your teeth healthy, vibrant and bright. Visit your dentist for regular checkups -- Make sure you visit the dentist twice a year for regularly scheduled checkups. During these professional cleanings, we will remove tartar and plaque which can stain your teeth. Follow Up with At-Home Whitening -- With our custom fitted at-home teeth whitening kits, you can periodically touch up your results in the comfort of your home. While no major health problems have been attributed to tooth whitening products that have been used as directed, poor quality materials or excessive whitening can still injure your teeth. To ensure the highest standard of teeth whitening safety, you should always have an experienced cosmetic dentist assess your oral health first. Not only will this prevent you from harming teeth that might have sensitivities to whitening, particularly for teenagers, but it will also help you determine whether or not teeth whitening will effectively address your discoloration. The good news is that when you opt for professional-grade teeth whitening systems administered by a highly skilled and experienced cosmetic dentist, your whitening treatment will be very safe and effective. Please contact teeth whitening specialist Dr. Scott Greenhalgh using the form on this page or call 303-988-9060 today to schedule a tooth whitening consultation. We serve patients in Lakewood, Denver and the surrounding areas of Colorado.